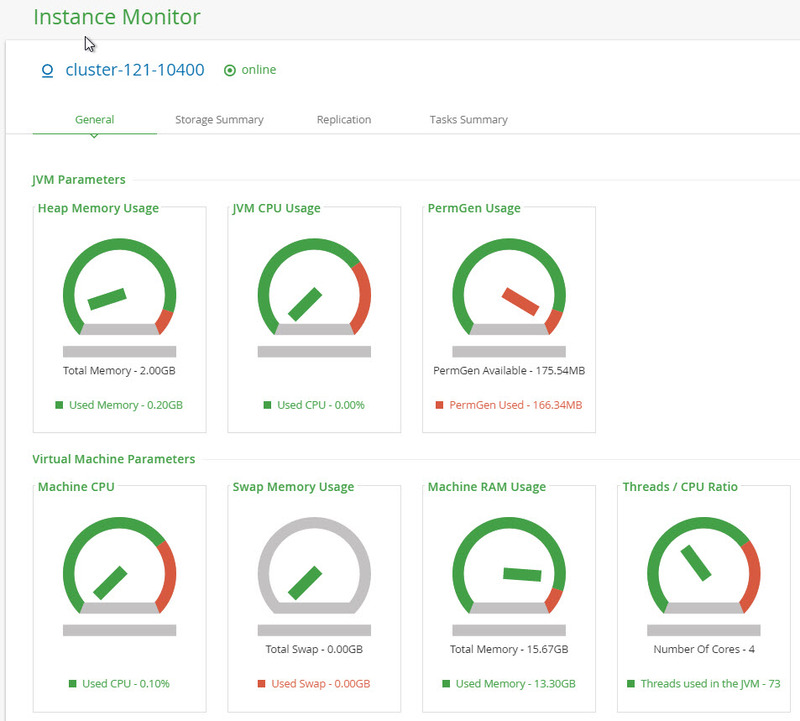 A couple of months ago we released the preview version of JFrog Mission Control. As a new product, we were eager to get it out there and start getting feedback. Since then we have been in constant contact with dozens of our customers who downloaded it learning what worked well and what was missing. So now, we are ready and have just released Mission Control for general availability, and, thanks to the many valuable inputs we had from our customers, JFrog Mission Control is now better, stronger and faster. It is also the only tool that lets you manage the global workflow of your binary artifacts so that you can Release Fast or Die. Memory and CPU: JVM parameters such as heap, CPU, and PermGen usage, as well as machine parameters such as machine CPU, swap memory, RAM, and threads. Storage: Complete Artifactory storage summary including number and size of binaries, as well as filestore and repository usage data. Replication status: Detailed monitoring of replication sessions, scheduled runs, run duration and proxy settings. Task monitor: Detailed information about Artifactory under-the-hood showing tasks such as GC, indexing and others. The Mission Control dashboard was always a great way to get an instant indication if any of your Artifactory instances was down. The new enhanced dashboard shows you exactly where your Artifactory instances are on a world map, so now you can also know which instance (if any) needs your attention and which of your international sites may need to be alerted. But the map gives you more. Any replication relationships between two Artifactory instances is also visually displayed so you can see if your global binary Artifact workflow is running smoothly. You have an Artifactory instance perfectly configured. Now you need to configure another three in pretty much the same way. Well, you can write configuration scripts for each parameter you want to configure and apply them on all three instances in one shot. But you still need to look up all of those configurations and copy them from your source instance which is already set up. Hmm, what did we have there? LDAP settings, LDAP groups, a proxy, six standard repositories, a bunch of users, groups, and permissions, and it goes on. That’s quite a bit of error-prone copying you need to do, or do you? Until now, that was the way to go, but in version 1.0 we have introduced the Import Configuration feature. This neat and extremely convenient feature lets you import a configuration from any Artifactory instance into a configuration script in a few easy steps. If necessary, you can then tweak the script and then save it in Mission Control. Now you have a script that will configure all those other Artifactory instances in the same way your source instance is configured, and we already know how easy it is to apply configuration scripts. Effectively, you’re doing copy/paste to configurations. We all know that feeling when it’s that time of the year to do our tax returns. It’s one of those things that has to get done, but we never really have a good time to do it. Well, it’s like that when you have to renew your Artifactory license. Of course, we’ll send you your licenses, but now you have to login to all your Artifactory instances and paste in the new license separately. Well, not any more. With Mission Control’s new license management, you can paste all your licenses into Mission Control, match up each license with its Artifactory instance, and deploy all the licenses at once. Simple, easy, manageable. In all facets of the software industry, the key to delivering faster is automation. Whether it’s your CI/CD pipeline, automation testing or even, your marketing automation tools which help you hone in on your prospects faster than ever before. The same holds when you look at the activities you engage in to administer all your Artifactory instances. Any of those activities that you could automate would then free up your time for those tasks that require a human touch. Mission Control REST API does exactly that. You have endpoints that let you configure instances, repositories, users, groups, permissions, and more which you can work into your automated scripts. For example, as soon as you have a new Artifactory instance running, you can write a script that sets it up with all the initial configurations automatically, without even needing to log into the Mission Control UI. Adding a new employee to your LDAP server? You can have him or her automatically added as a user in all Artifactory instances. Whatever your organization’s policies, you can now have scripts that implement them automatically. It has been a journey getting here, and we’re happy to have resolved some of the teething pains we saw with our preview version. And now that we’re here, it’s clear that our journey is really just beginning. Keep your eyes peeled as Mission Control proves itself as an invaluable tool for enterprises to monitor their workflow of binary artifacts and optimize how they develop software at global scale.